Person Centered Planning (PCP) meetings are required for all first and fourth year students. Parents are an active part of that planning meeting. The PCP meetings are held on Tuesdays at 10am or noon. Parents can participate in person or via conference call. Parent Brief - Promoting effective parent involvement in secondary education and transition. As the parent of a son or daughter with an intellectual disability, you have likely been providing advocacy and support for their educational needs for many years. You have attended IEP meetings, called and visited teachers, received regular reports on how your child is doing in school, and when things got tough you were there at the school assuring that needs were being met. Now your son or daughter is going off to college, perhaps as part of a transition program or as a high school graduate. You will continue to provide important support, and it is valuable for you to learn about the services that are available at the college. However, since your son or daughter is now an adult learner, it is important for you to become aware of your changing role. Perhaps one of the most difficult changes you will experience is that your supportive role must be "behind the scenes." You are no longer the spokesperson—the student must become a self-advocate and not depend on you. However, you can still play an important role by encouraging and supporting your student's quest to learn self-advocacy skills and become a self-sufficient adult. These articles may assist you in moving forward. Fialka, J. (2010). What’s a parent to do? Micah’s college dream. Impact, 23. Retrieved from http://ici.umn.edu/products/impact/233/233.pdf. 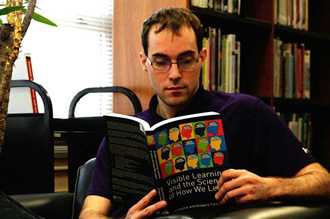 As a young adult with intellectual disabilities, Micah fought for the right to attend college. This article highlights principles that his parents value after their experience of supporting his dream, namely: acknowledge a range of feelings, support great expectations, be mindful of the changing parental roles, build a relationship with allies and his peers and expect to live with uncertainty and risk See more about Micah at www.throughthesamedoor.com. 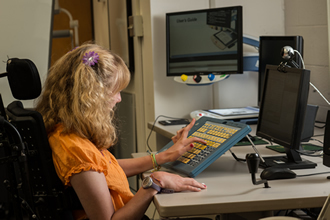 Impact is published by the Institute on Community Integration & Research and Training Center on Community Living, University Center for Excellence in Developmental Disabilities at the University of Minnesota online. Grigal, M. and Hart, D. (2010, September). INSIGHT: What’s the point? A reflection about the purpose and outcomes of college for students with intellectual disabilities. Retrieved from http://www.thinkcollege.net/images/stories/INSIGHT_2.pdf. This article explores the practical goals of postsecondary education for individuals with intellectual disabilities. INSIGHT is a Think College Brief on Policy, Research and Practice. 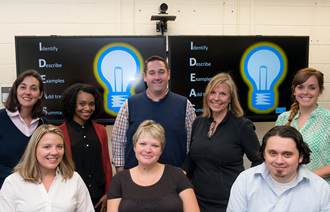 Think College is the National Coordinating Center for Postsecondary Programs for Students with Developmental Disabilities and is dedicated to developing, expanding, and improving inclusive higher education options for people with intellectual disability. Grigal, M., Weir, C., Hart, D. & Opsal, C. (2013, June). The impact of college on self-determination Retrieved from http://ngsd.org/sites/default/files/research_to_practice_sd_-_issue_6.pdf. Participating in postsecondary programs provides our children with the opportunity to learn in an environment where they are surrounded by people who support and promote their growth by providing them with access to experiences, including successes and mistakes, that foster their development of life skills. From the National Gateway to Self-determination, from the National Training Initiative on Self-Determination; Association of University Centers on Disabilities. Idaho Council on Developmental Disabilities (2007, March). Parents and self-determination: From one parent to another. Retrieved from http://www.icdd.idaho.gov/pdf/parent_league/Parents%20and%20Self%20Determination%203-07.pdf. While this article is directed to Idaho parents, it outlines why it is beneficial to allow our children with intellectual disabilities to be central in planning their own futures. The Idaho Council on Developmental Disabilities promotes the capacity of people with developmental disabilities in Idaho and their families to determine, access, and direct the services and/or support they need to live the lives they choose, and to build the communities ability to support their choices. Mazzoni, M. (2012, March 28). Self-determination: The ingredients. Retrieved from http://lifeafterieps.com/self-determination-the-ingredients/. A brief guide to the “why” and “how” of self-determination. LifeafterIEPs is a blog site written by a special educator with personal experience advocating for young adult family members with disabilities. McCormick, M., Fialka, J., Klein, C., Daughtery, K., & Sinclair, J. (2013, April 17). Think College! : Family perspectives on postsecondary education [webinar] in the Think College! Series. Retrieved from http://www.thinkcollege.net/test-jevents/icalrepeat.detail/2013/04/17/3/104|130/family-perspectives. Parents, whose sons or daughters are postsecondary students with intellectual disabilities, discuss the changing role of parents and ways to navigate the process. Think College! is a national organization dedicated to developing, expanding, and improving inclusive higher education options for people with intellectual disability. National Center on Secondary Education and Transition (NCSET) and The PACER Center. (2002, March). Parenting postsecondary students with disabilities: Becoming the mentor, advocate, and guide your young adult needs: Parent brief. Retrieved from http://www.ncset.org/publications/viewdesc.asp?id=208. As parents, we continue to play important, but different roles, as our children with disabilities mature. The National Center on Secondary Education and Transition (NCSET) was established to create opportunities for youth with disabilities to achieve successful futures. The PACER Center (Parent Advocacy Coalition for Educational Rights) works to expand opportunities and enhance the quality of life of children and young adults with disabilities and their families, based on the concept of parents helping parents. Nelson, V. (2001, November 4). How parents can help college students value their mistakes. Retrieved from http://www.collegeparents.org/members/resources/articles/how-parents-can-help-college-students-value-their-mistakes. Everyone makes mistakes. This article, written for the parents of ANY college student, discusses how, as parents, we can help our college students accept that mistakes happen and use those experience as opportunities to learn. College Parents of America is a membership organization of current and future college parents. Nelson, V. (2009, December 8). Ten parental habits that can negatively affect your college student. Retrieved from http://www.collegeparents.org/members/resources/articles/ten-parental-habits-can-negatively-affect-your-college-student. As parents we want our children to succeed, however, some of the things we may do ae likely to make learning to be independent even harder. Shriners Hospitals for Children (2007, February). Moving on: Transition tips for parents of young adults with disabilities. Retrieved from www.medicalhomeportal.org/link/2475. Information about ways to help your young adult with a disability become independent including help with learning to let go and links to other sources of useful information. Shriners Hospitals for Children provide healthcare to children in collaborative family-centered settings and conduct research to find new ways to improve the quality of care and life of children and families. Utah Parent Center (2010). Empowering parents. Content taken from the Utah Parent Center handbook: From NO where to KNOW where: A parent handbook for the transition to adult life. Retrieved from at http://www.utahparentcenter.org/wp-content/uploads/2011/09/Empowering_Parents.pdf. Our role as parents changes when our children enter college. The changes are sometimes scary; they require us to become less “protector” and more “cheerleader” for our child. Our children deserve the right to make mistakes and learn from them. Change, while uncomfortable, is worthwhile. The Utah Parent Center is the Utah Parent Training and Information Center, funded by the U.S. Department of Education's Office of Special Education Programs. Van der Zande, I. (2011.) Helicopters or protectors? How to keep kids safe without unhelpful hovering. Retrieved from http://www.kidpower.org/library/article/parents-are-you-helicopters-or-protectors. As parents, in order to nurture our child’s development we need to allow them to develop confidence in their abilities to take care of themselves. While we may want to protect our child from making mistakes or feeling bad, those experiences are essential for their ability to develop and flourish. Kidpower International is a global non-profit whose mission is teaching positive, practical personal safety skills to protect people of all ages and abilities from bullying, molestation, abduction, and other violence and to prepare them to develop positive relationships that enrich their lives. Weir, K., Cooney, M., Walter, M., & Moss, C. (u.d.) Fostering self-determination among children and youth with disabilities: Ideas from parents for parents. Retrieved from http://www.waisman.wisc.edu/naturalsupports/pdfs/FosteringSelfDetermination.pdf. There is a link between the development of self-determination and positive outcomes for our children. This is a compilation of information that was collected from parents to help other parents. 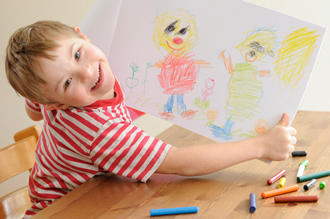 While some of the details are written about younger children, the concepts apply to our post-secondary children with special needs. This resource is from the Pathways to Independence Natural Supports Project at the Waisman Center at the University of Wisconsin-Madison. The goal of the project is to discover, support, and disseminate creative and promising approaches for supporting youth with disabilities to participate more fully and naturally in school, work, and community activities. Wheeler, M. (2000). The road to post-secondary education: Questions to consider. Retrieved from http://www.iidc.indiana.edu/?pageld-443. This is a guide to careful planning and proper supports for our children with autism so that they can avoid some struggles and enjoy a successful and meaningful postsecondary experience. 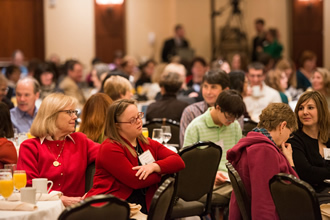 From Indiana Institute on Disability and Community whose mission is to work with communities to welcome, value, and support the meaningful participation of people of all ages and abilities through research, education, and service. Additionally, our mental health team can be reached by phone: 703-993-3853 or email. Barbara Smith, PhD, Mason LIFE Program Clinical Psychologist, bsmith47@gmu.edu; Renata Daum, Mental Health Liaison, rdaum@gmu.edu; and Luiza Pagonis, Mental Health Liaison, lrodri22@gmu.edu.